The Xperia V is Sony's new LTE-specific offering. There's a 4.3 inch HD display and the V packs the same 13 MP camera as the new Xperia T flagship, and comes with IP57 rating for dust and water resistance at 1 meter for up to 30 minutes. Like the other Xperia devices introduced today, it has a curved back panel with a matte finish on the plastic, which is excellent at deterring fingerprints and smudges. Highlights of the ICS build for this phone includes quick camera activation which enables you to "go from sleep to snap in just over a second," and ClearAudio+ audio enhancements for playing music. The device also supports the usual array of connectivity features including NFC, and will be available in Black, White, and Pink. The Sony Xperia J features a slim and stylish design. It has a flat front and an arched back made with a smudge-resistant matte finish. The 5 MP camera lens is in the upper right corner along with a single LED flash. The front is where the 4" FWVGA 854 x 480 capacitive touchscreen is. It's a bright 16M color unit with good viewing angles. The display is beveled by a glossy plastic rim. The device feels really thin. It's 9.2 mm thick and weighs 130 g. The Sony Xperia J comes in a variety of colors - black, white, pink and gold. The surface of the colored versions feels slightly different to touch than the black version, but is still good in hiding fingerprints. The phone is running on the lower-powered single-core Cortex-A5 Qualcomm MSM7227A SoC. The outdated Adreno 200 handles the graphics gruntwork. 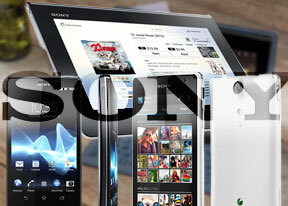 Of course, top of the line hardware is out of the question with a budget friendly phone such as the Sony Xperia J.